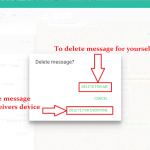 You are here: Home / Delete Email Accounts / How to Delete Gmail Account? You want to open a new Gmail account, or you get bored using Gmail? Once you delete Gmail account permanently, all your data stored on Google Drive, Google photos, and other places will be deleted.? So make sure, that you have backed up all the data before you delete your Gmail account. But it won’t delete entire Google account. 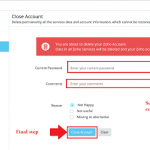 You can delete Gmail account just by following simple steps below. You’ll lose access to Gmail email account. Gmail address can’t be used on future. You may not be able to use any third-party services linked with Gmail account. 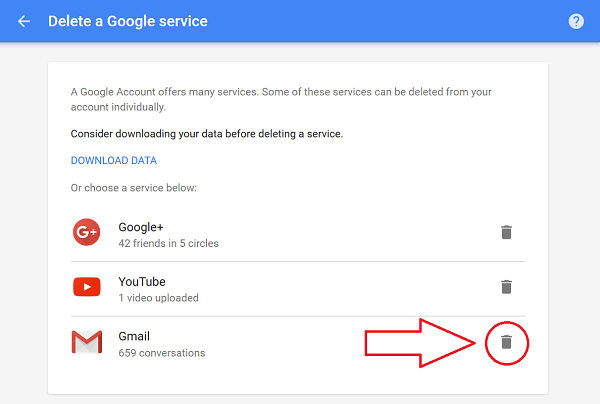 Create a back-up (download Google data) before you start terminating Gmail account. On your web browser, visit Google Account Setting page and login to your Gmail email account. 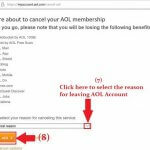 Under the “Account Preferences” scroll down to “Delete your account or services” heading. After that, click on “Delete products“. 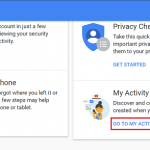 If you want to terminate entire Google account, select “Delete Google account and data“. Then Google team will ask to re-enter your Gmail login password for the Gmail email account that is to be terminated. Click on ‘delete icon‘ next to ‘Gmail‘ logo under ‘Delete a Google services‘ heading as shown below. Enter new primary email address to access other Google products. And click “Send Verification Email” button. 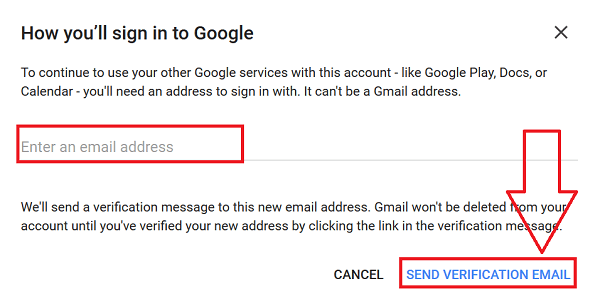 Notice: – Google team will send you verification message to this new email address. Now login to a primary email address to confirm the action. 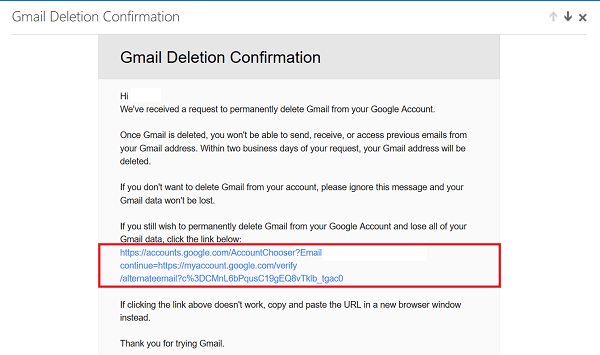 Check recent email from Google with the subject line ‘Gmail Deletion Confirmation’. 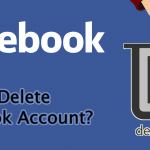 Click on the link and verify your delete Gmail account request. Copy and paste the URL in a new browser window if the link does not work. Remember that, your Gmail email account won’t be deleted from Google until you click the link you received in the verification email.